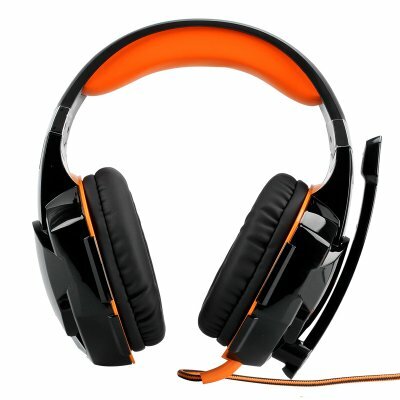 Successfully Added Kotion Each G2000 Pro Gaming Headset - Stereo Headphones, Retractable Mic, Built-In LED, Plush Padding, Durable Audio Lead to your Shopping Cart. You may be making your way through a magical forest in Warcraft or joining your friends on a rescue mission in Call of Duty - whatever it is, you deserve the best audio experience available. With the Kotion Each G2000 pro gaming headset, you will be able to leave the real world behind and get completely immersed in the game of your choice. So, no matter how loud your neighbor may be blasting music, or how lovely birds may be chirping outside – nothing will stop you from locking the door, closing the curtains and spending the day just the way you want. The headset aims to provide an immersive experience for hours of gameplay – it’s padded on the top and around the ears, making sure you feel no discomfort, and as the time goes by, you may even completely forget you are wearing a headset at all. To make sure nothing gets in the way, all the controls are conveniently located on the audio lead, letting you quickly adjust the volume or mute the mic when needed. The mic itself is retractable, and you can pull it down in an instant when you need to exchange a few words with fellow gamers or pull it back up when it’s time to stop talking and focus on the game. The audio lead has been made extra durable and will stay intact even as you accidentally jerk it or ride over it with your chair. As you are playing a cool game, why not look cool as you do it? The headset comes with built-in LED lights, that will turn on as you plug it in and enhance the gaming atmosphere as the room gets dark. It’s not all about the gaming. You can easily and conveniently use the headset to chat with friends on Skype or simply listen to music. The Kotion Each G2000 pro gaming headset comes with 12 months warranty. Brought to you by the leader in electronic devices as well as wholesale pro gaming headsets, Chinavasion..